Katharina's stamp company Whiff of Joy will be releasinge new stamps on January 3rd. She and her amazing DT have sneak peeks up and Katharina has a sketch challenge on her blog. The winner will get a cute stamp from the new line! I couldn't resist and managed to make a card quickly while the children were busy playing with their new Wii! It was a Christmas gift to them all from my husband's cousin who spoils them all the time! It is a lot of fun and gets everyone up and moving! I wish you all a wonderful New Year and hope there is loads of inky goodness in store for you in 2009! Wow Jeanette, this is too gorgeous, I'm lost for words, the pink, the image. Love the skunk creation below too, linked your candy on my blog but not entering as I won last time. Good luck to all! This is a beautiful card, I love the colours you have used. An absolutely beautiful card!! Happy New Year to you! Soft pinks and caramel...very sweet. Great colouring as always. 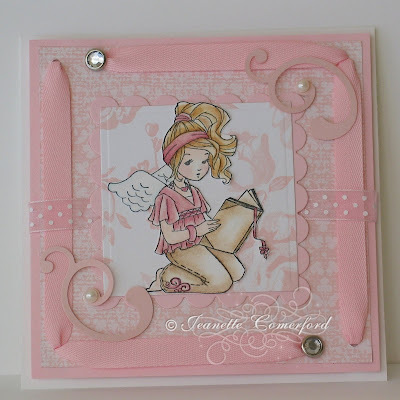 Such a lovely card, I love the pale pink colour and how you've used the ribbon. oh très chic cette carte Jeannette j'aime beaucp !!! Je te souhaite une bonne et heureuse année avec pleins de bonnes choses et pleins de scrap !!!! Love this card, it's so lovely and pink. Oooh Jeanette!!! I jaw just hit the desk - this is just breathtaking sweetie. I absolultely love it!! Lovely image and I love the pink! Jeanette this is gorgeous! WOW! Stunning! This is the sweetest card ever. great one...thanks for sharing your talents with so many! So pretty Jeanette! Love the pinks and the image is adorable!! Wow Jeanette, you did it again!!! What a showcast of Melinda. Simply terrific. I am speechless. Thanks for this heavenly entry!! And the idea with the ribbon is unique! Follow Jeanette's board My Crafting Videos on Pinterest. All designs, narrative and photographs on Happy Thoughts & Inkspots are the property of ©2008-2018 Jeanette Comerford. Content shared on this site should not be used, borrowed, or published for ANY reason without written authorization. It is illegal for any unauthorized person or company to scan, copy, duplicate, manipulate, alter, or reproduce in any way, my work without permission. Please contact me for all usage requests. Thank you.